As Doug Porter aptly observed in his election post-mortem last week, big money spoke loudly in the big races on June 5th. This is nothing new but what happened in Wisconsin was truly historic. It was a soul-crushing defeat—not unexpected, but a gut punch nonetheless. Labor’s loss in the recall battle against Governor Scott Walker will surely go down as a key sequel to the Professional Air Traffic Controllers Organization (PATCO) strike for unionized public sector workers in America. 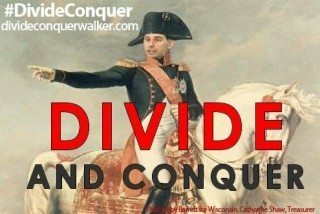 Indeed, Governor Walker clearly said that he wanted to emulate that model, and he just won a very big battle in the war against collective bargaining in the United States. Why is the PATCO strike so significant? After Reagan fired the striking air traffic controllers and crushed their union in 1981, it sent a signal to corporate America that it was open season on labor. Thus, from the auto industry to the airlines, from meatpacking to manufacturing the titans of industry went after labor with a ferocity not seen for generations. The result was the total decimation of unions across the country, particularly in the rustbelt. Companies cut wages, downsized, outsourced, and union-busted with gusto, gutting union density and ushering in a new era of top-down class war. Reagan had been backed by Wall Street in his run for the White House and they, along with right-wing Christians, wanted to restructure America and turn back the tide that President Franklin D. Roosevelt started — a tide that was intended to make life better for the average working person. The rich hated paying better wages and providing benefits. They hated paying taxes even more. And they despised unions. And just like the unknowing PATCO strikers who had supported Reagan in 1980, a significant chunk of union workers and their non-union neighbors in Wisconsin actually supported Walker this time, the biggest percentage of them being private sector workers resentful of the superior benefits of their fellow workers in the public sector. And then there were the non-union workers in the middle class suburbs who simply did not identify with the union cause and perhaps were more upset that the recall was being used politically than with the demise of collective bargaining rights. Unions, for these folks, are a problematic thing of the past. And not all of those voters in Wisconsin or others like them across the country are right-wing ideologues. As Andy Stern, the former president of the Service Employees International Union, put it to me: “White-collar professionals tend to appreciate what unions did for their parents. But they don’t view today’s janitors or nurse’s aides in the same way.” Instead, they — or, rather, we — tend to focus on the many things that are wrong with unions, exemplified these days by the pensions of public service employees that are breaking the backs of so many cities and states. Unions seem like a spent force, and we tend not to lament their demise. [Timothy] Noah [the author of a key new book on economic inequality] includes himself as one of those liberals “who spent too much time beating up unions,” as he told me recently. . . . His thinking began to change in the early 1990s when he read “Which Side Are You On?” It is a powerful meditation on the difficulties unions face, written by Thomas Geoghegan, a Chicago labor lawyer. Researching “The Great Divergence” reinforced Noah’s growing view that when liberals turned their backs on unions — when they put, in his words, “identity politics over economic justice” — they made a terrible mistake. Thus for some—Republicans and Democrats alike—public sector workers, not the rich, have become the new privileged class, easily demonized with the help of millions of dollars of corporate money. But while the emotional gratification of sticking it to teachers, firefighters, cops, and other public sector workers might be momentarily satisfying, the historical record shows that as American labor unions have been gutted over the last thirty years, the standard of living for the vast majority of all workers, union and non-union has declined. However, over the next 30 years—an era highlighted by the filibuster of labor law reform in 1978, the Reagan administration’s crushing of the PATCO strike, and the passage of anti-worker trade deals with Mexico and China—labor’s bargaining power collapsed. The consequences are driven home by the figure below, which juxtaposes the historical trajectory of union density and the income share claimed by the richest 10 percent of Americans. 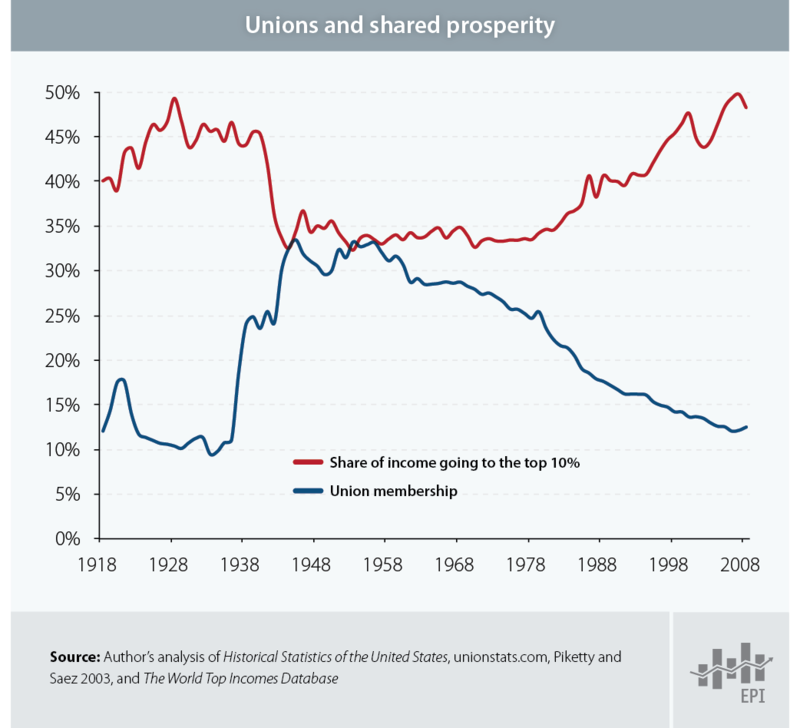 Union membership has fallen and income inequality has worsened—reaching levels not seen since the 1920s. Unfortunately, most Americans aren’t taught any labor history in school at any level and they just don’t know this. Hence, they are easy marks for the bogus populism of the right that ignores real existing class divisions and the unparalleled concentration of power in the hands of the actual economic elite in favor of the scapegoating of the last group of American workers with collective bargaining rights. The result of this politics of resentment is not to raise anybody up, but simply to drag everybody down. And the corporate owned media saturated with political ads overwhelmingly in favor of the interests of the rich doesn’t do anything to adequately educate the public. Hence the question is always “Why do they have something you don’t have?”, rather than “Why don’t we all have better pay, pensions, and adequate health benefits?” If we asked the second question as much as the first, the national political discussion would be very different. Thus those who are cheering on “reform” in Wisconsin and here in its western annex are really largely unwitting boosters for continuing and deepening economic inequality. Taking away the pensions of city employees or gutting teachers’ unions won’t do a damn thing to raise the economic standard of living for the average San Diegan or Wisconsinite. In fact, it just helps lower all boats. And once there are no unions to kick around and people find themselves in the same or worse economic circumstances, they will either realize the error of their ways or, more likely, turn to the next convenient scapegoat—the old folks sucking up Social Security that they’ll never get, poor kids or the disabled getting public aid their kids don’t get, immigrants in public schools stealing their tax dollars, the evil public sector itself standing in the way of all things good . . . the list goes on and on but sticking it to the next scapegoat will never solve the problem. But those are the divide and conquer politics of austerity. Ah, the war of all against all: it’s the gift that keeps on giving. Great analysis Jim. Good spur to action. Y’all should tweet these articles and put them on Facebook. Talking about “telling it like is,” this is it. How treacherous a man Ronald Reagan came to my attention in the 60’s when he went after Angela Davis when she was at UCSD – because she was a “communist” like that was equivalent to being the anti-Christ or something. What was most shocking about Reagan’s firing of all air traffic controllers was that he got away with it — replacements docilely lined up, not a peep of protest from PATCO members, not a gesture of solidarity from other unions, no nationwide general strike to demonstrate to everyone that the President had overstepped. In Europe, everything would have been brought to a standstill. Sic transit gloria. I remember that situation well. I was one year out of high school and remember knowing some RABID Reagan supporters who are not only glad the air traffic controllers lost their jobs but were hoping that they AND their families would suffer financially for the rest of their lives. Ahhh the ’80’s. I guess the mentality of some will never change. Those who sit here and lament and cry about lost union power may never realize that the rest of the world doesn’t care about your union, or what you think you deserve. They don’t care if something is made in America. While you cry because you think you’r entitled to a certain wage, other people are more than happy to do the work you refuse to, for wages less than you. And quite frankly, neither do I. While you bawl about your union, I’m working, starting a business, making it successful, and enjoying the ride. At one point I thought I could share my experience and see others learn what I have learned, but you’re so busy fighting the system and hoping to be able to earn a living not by performing but by collaborating with other lazy workers to scared to take a chance and strike out on their own to compete against the companies that supposedly “underpay” you. No one cares about your “working conditions” OSHA will handle that. No one cares about your “wages.” Shut up and get to work. Perhaps if you did more, you’d be worth higher compensation. Perhaps if you left your job and started a business, you could treat your employees how you see fit. I’m sick of hearing the failed message. I worked in a union. Best move I ever made was leaving it. Thank god I did. I’d hate to be just another entitled, ornery union member who thinks his company screwed him over his whole life. This comment was moderated to appear in its original form to broadcast the view that it represents – a view that hinders the development of democracy, a view that sees it okay to pit Americans against each other, a tremendous callousness – “shut up and get to work” – a classic class bias, and your basic “each man for himself” attitude that has held back our evolution. Angry and hateful, but true enough. Few seem to care anymore about the intrinsic value of making stuff in America, or depressed Walmart wages, or “temp” employment status without a “benefit” in sight, or working conditions “handled” by OSHA — like falling into a radioactive pool up at San Onofre? It IS every man for himself these days, and folks like Vhou812 are proud to say it flat out, even though they use a pseudonym when writing here. But such remarks don’t change the fact that American labor unions were responsible for broadening the base of the middle class in this country which, the last time I checked, was thought to be a good thing for a democratic nation. Increased home ownership, broad access to college education for workers’ children and greater opportunity for next-generation entry into better-paying professional occupations. Unions at their best offered a different idea about work and life: that there is a social compact among people; that a rising tide will lift all boats; that solidarity, prosperity and social progress are intertwined.